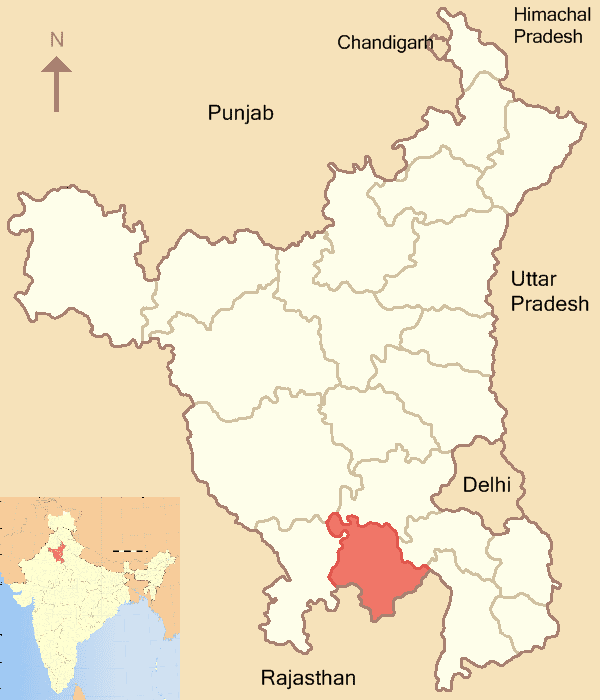 Karoli is a village located in Kosli Tehsil, Rewari District, Haryana, India. It is on the 1.5-kilometre approach road boarded to Bahu-Jholri on the Kosli–Kanina road and is 12 kilometres from Kosli and 7 kilometres from Kanina. The villages is 125 kilometres from Delhi, the capital of India. It is a large village with an approximate population of 5000 to 5500. There is average one person in army from each family.Smt. Kamala Devi is second ladies sarpanch of the village after Smt. Bhoori Devi. There are numerous temples in the village, of which that of Baba Thakur Ji has a special importance. All the villagers used to have dinner in the temple on Holi (The Indian festival). The village school was earlier up to class 10 and due to excellent result in entire district, the school has been upgraded to Senior Secondary School. The village was the birthplace of Hari Ram Arya, the Chairman of Haryana Azad Hind Fouj who participated in the Indian Independence Movement. Karoli has an average elevation of 245 metres (803 feet). It borders Lookhi, Bishoha, Bawwa, Gahra, Kotia and Lisan villages. The temperature can go as high as 46.5 degrees Celsius from May to July. Winter is from November to February, and the temperature can fall to 5 degrees Celsius in December and January. The village is adjacent to the Mahindergarh district and has dust storms in summer. Rugged hilly terrain of Aravali ranges as well as sandy dunes are found in nearby villages. The overall climate is dry. Rain falls from July to September. A little rain is experienced during winter also. Karoli village has a population of 3,628 Males constitute 52% of the population and females 48%. Karoli has an average literacy rate of 80%, higher than the national average of 59.5%: male literacy is 93%, and female literacy is 66%. In Karoli, 13% of the population is under 6 years of age. Yadav (Ahir) caste forms the majority of the population. Karoli is a part of Ahirwal, the land of Ahirs. Ahirwal includes Mahendragarh–Narnaul area and Alwar, which also have a large population of Ahirs (Yadavs). The adjacent districts of Mahendragarh and Alwar have Yadav-majority populations. Other castes in village are Brahmin, Kumhar, Chamar, Dhanak, Swamy (Bairagi), Khati & Nai. Delhi airport is about 120 km from Karoli (Via-Rewari). It is 3 hour's drive from the airport to Karoli by access-controlled eight-lane Delhi-Gurgaon expressway, four-lane NH 8 (Gurgaon-Jaipur highway) and then Rewari-Mahendergarh State Highway. State highways connect Karoli to all major towns in Haryana and adjacent districts of Rajasthan. Karoli is connected to Rewari by a state highway which is a major junction on Indian railway network. Five railway lines connect it to Delhi (82 km away) and Ahmedabad on the major North-West trunk route, Bhiwani and Hissar towards Punjab, Bikaner via Mahendragarh-Loharu-Sadulpur-Churu, Ajmer via Alwar and Jaipur, and Ajmer via Ringas. The sixth railway line is being built to connect Rewari to Jhajjhar and Rohtak. The seventh railway line connecting Rewari to Palwal and Khurja has been under planning for over two decades but not approved for construction (as on September 2010). Karoli is just 9 km from near by Railway station Kanina on Rewari-Luharu-Sadulpur-Bikaner Railway line and 13 KM from the Railway Station Kosli on Rewari-Bhiwani-Hissar-Sirsa railway line. Both of the stations (Kanina & Kosli) are connected to Delhi via Rewari. Karoli has three schools (Two government and one private) and one college (private). In nearby town Kanina and Kosli has a number of schools and two colleges in each town. A Government College in Nahar is the nearest. Ahir College, Kishanlal Public College and a several private colleges have been also set up in Rewari (40 km) and Mahendregarh (25 km) districts to teach engineering, nursing, management, etc. The village is honorably followed the panchayati raj system of Indian Constitution and a selected and independent panchayat is there to establish the law and order. The village is organized in 12 wards which constitute the panchayat. Hari Ram Arya Freedom Fighter & The Chairman Of Haryana Sawtantrta Senani Samman Samiti, Chandigarh .He is also the founder member of Dujana Rajya Prajamandal Movement and also the founder member of Babu Bal Mukund Gupt Sahitya Sanrakhsan Samiti. He is also Acting President of All India Freedom Fighters Organisation, 7, Jantar Mantar Road, New Delhi.He is in the field of social service and political movements since 1939. He had also written several books on freedom movement&social problems.He had actively participated in faridkot Satayagrah in the leadership of Nehru ji. He has an experience of working with famous leaders like Pt. Nehru, Babu Vrissh Bhan, Ch. Ranveer Singh, Gyani Jail Singh ji.